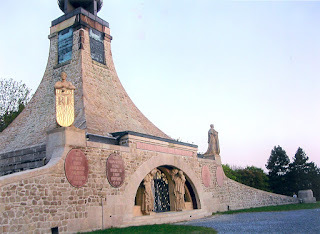 The Sudetenland is near the German border, and the area has been in the middle of conflict for centuries - its location is the best entry to Bohemia from the northwest. www.britannica.com/eb/article-9022726/ChebSee also the blog on Places of Petr Ginz for more photographs and information posts on Cheb. The area's identity goes back to 870AD, and the name to 906AD. The territory was annexed by Hitler in the 1938. See en.wikipedia.org/wiki/Cheb. Then was made part of the Czech area again, and feelings run fierce, see people.bu.edu/crr/ICWA%20for%20Web/Awakening.htm. Roland here may be the same Roland as the son of Charlemagne (see timeline). In fountains in city squares in Europe, he is often representing free market privileges, when those were granted to the town. But why the wild man? We understand that a figure signifies that the town had official market privileges. Seewww.mestocheb.cz/html/e_pamatky.htm. 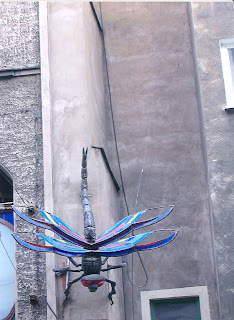 And we saw another in Bratislava, Slovakia; and understand there is also one at Bremen, Germany. 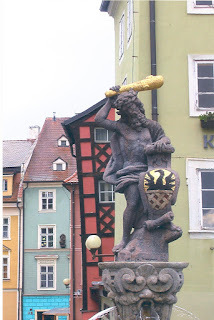 But there is another Roland statue here in Cheb -- with Roland the Knight, very dignified, with his unbreakable sword, at the well-fountain. What is the connection of the Savage Man, also connected at the sites with Roland, and the Knight. Since Roland is also the nephew of Charlemagne, or some sites merely say he fought for Charlemagne, we looked up dates and how the market Roland fits with the fighter. As Charlemagne's nephew (or officer) he fought and died -- killed by rebellious Basques at Roncesvalles near the Pyrenees when he went to fight against the Moors, when they were taking over Spain. Charlemagne was emperor of Germany in 800 AD, and Germany was little more than wilderness at the time. Perhaps this savage man is closer to the reality than the later knight. If he were Roland, however, he would have his unbreakable sword, not this club. Is that so? Roland became a "pop icon" - a symbol of cities becoming independent of the nobility, see the general site at ://en.wikipedia.org/wiki/Roland/. 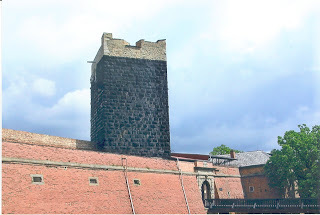 Cheb, The Sudetenland - The Castle. Renaissance stove. 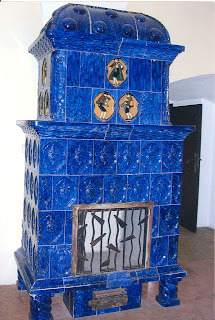 First, the creature comforts of a Renaissance stove, the ceramic wood-burning stove at Cheb Castle. Stoves like this are in homes, castles, anywhere that a relatively efficient heating system was needed. For many, there were ducts and outlets to chimneys for heating the entire place; and many such stoves. For a look at the role of this kind of stove in theology, lite, see Martin Luther's Stove in Wittenberg. There he mentored many fellow philosopher-theologians. Behind it, as in many such situations, there resided a third party mischief-maker. Now that we are warmed up, what happened here. This Romanesque fortress castle was originally built by the Holy Roman Emperor Friedrich Barbarossa - Red Beard. See more of Barbarossa at en.wikipedia.org/wiki/Frederick_I,_Holy_Roman_Emperor. For the castle itself, see www.marianskelazne.cz/en/turistika-volny-cas/tips-for-trips/. Scroll down to Cheb. It dates from the 12th century, at a place of earlier Slavic settlements 10th-11th centuries. See www.mestocheb.cz/html/e_pamatky.htm. 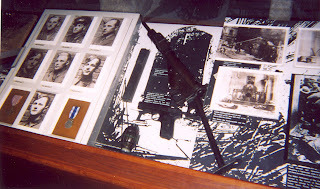 See also the Cheb-Sudetenland posts at The Places of Petr Ginz, from a boy's diary while living in Prague 1941-1942. The old "Sachsen" area of Germany-area borders on the Bohemia of the old maps, and ethnic groups have lived on both sides - see the map of the Holy Roman Empire in the 12th Century at www.geocities.com/wenedyk/ib/hre_map.html. Watch European boundaries shift at historymedren.about.com/library/atlas/blathredex.htm. There is a fine chapel, and a large undercrypt-type space beneath. In some areas, the vast undercrypts of churches, with the huge supporting pillars, were used as bomb shelters. Undercrypts were used for burials, places for valued items, special chapels. Some have a hole in the ceiling that brings in light, covered in a transparent material, if you look up, goes straight to a mosaic or other symbol or religious figure on the ceiling (way up there) of the main sanctuary. 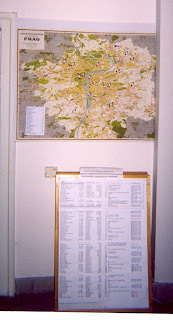 To tackle this, stay in Brno (we didn't) and go to the Austerlitz area on its own. We drove right past Brno, expecting to find a focused battle area at Austerlitz, with plenty of accommodations and all well marked. Not so. There will be a small sign on the motorway showing a Napoleon symbol - that turns out to be near the tree where he watched the battle at dawn. No more. And then you are on your own to find where in the huge battle area, almost without bounds, there might be the monument we saw in the guidebook. To find it, we finally asked a pedestrian who then offered to show us because his house was on the way, so in he came. Lordy watching over little sparrows and us, it was fine and we all had fun. And got there. And then came back to get a place to stay. Also no problem. The monument was lovely at sunset, out in the country still, wide expanses of open space where battle and skirmish and blood and shouts took over at one time. Did all this effort and killing mean anything in the long run. It delayed the downfall of Napoleon to 1812, some seven years later. See www.sparknotes.com/history/european/napoleonic/section9.rhtml (that is a student exam-crib source - take a look). Plzen is more than the home of pilsner. 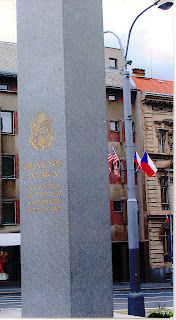 The American General George Patton liberated it with his tanks in World War II, and here is the memorial with the rare sentiment these days, "Thank you, America." Patton is buried at the Hamm Military Cemetery at Luxembourg. See Luxembourg Road Ways. Read about it, and the later soviet rewrite, at www.praguepost.com/articles/2007/05/09/heroes-welcome.php. 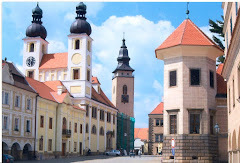 Jews have lived in the area of the Czech Republic for a thousand years, at about 2 1/2% of the population, until WWII. See www.bethor.org/articles/czechtorah2001.html. Some 80,000 were killed in WWII's "final solution." See www.radio.cz/en/article/78537. 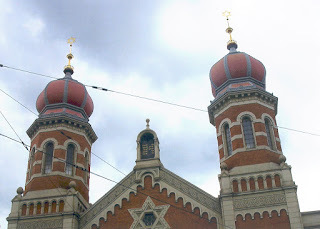 The Great Synagogue in Plzen is third largest in the world, after Jerusalem and Budapest. Read about synagogues and see a full-length Plzen photo at en.wikipedia.org/wiki/Synagogue. There is no congregation left there now. 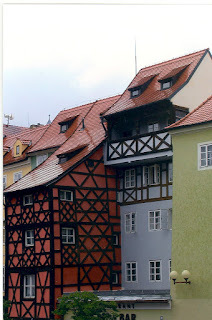 See Places of Petr Ginz for more photographs and information posts on Pilsen - Plzen. He was a boy in Prague who kept a diary in 1941-1942, and the places he writes about are researched and photos offered also there. 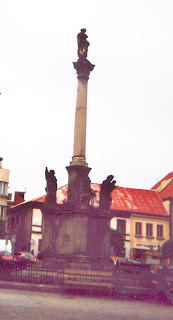 Hradec Kralove was the home town of the mother of Petr Ginz. 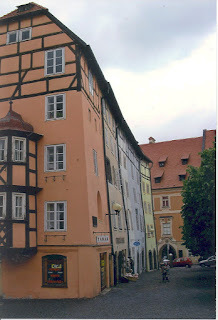 Please shift to the blog on Places of Petr Ginz for more photographs and information posts on Hradec Kralove. Petr's mother (who was not Jewish) was from Hradec Kralove, and she visited there from Prague. Other relatives came to Prague to see the family, bringing special foods from the country. Do read "The Diary of Petr Ginz 1941-42," the entries by this 12-14-year old child of a mixed Jewish-Aryan marriage during the occupation, and his art and other writing, now published in English after its discovery in 1993 and publication in Europe. It is edited by his sister, Chava Pressburger, and translated by Elena Lappin, Atlantic Monthly Press NY 2007. Unlike Anne Frank, who was in hiding with limited things to do, Petr was out and in school, doing errands, watching family members taken away, and in direct experiential contact with everyday Nazi horrors. 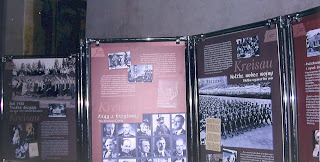 The panorama of his short life (he died in Auschwitz, as did Anne Frank) includes Prague, where he lived with his family during the occupation; and incudes references to Plzen, Hradec Kralove, the Sudetenland, then Terezin or Theresienstadt ghetto, where he was taken; and ultimately to Auschwitz - Osweicim, Poland, where he was killed. Travel perils. 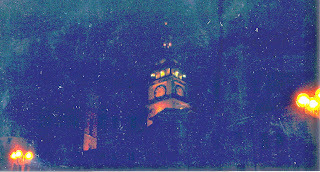 Out the hotel window was the clock tower, there in the center. Bad idea. Bong. And, the long hand points to the hour and the short hand points to the minute, so use your watch instead. At one time, the silence of these towers was not welcome, but foreboding. Young teenager Petr Ginz, in his newly-translated "Diary of Petr Ginz 1941-1942," see www.iht.com/articles/2007/04/12/arts/diary.php, wrote in Prague at page 94, "You can't hear any bells ringing at all, because the Germans have confiscated them all; they will probably make cannons out of them." Only one bell remained. 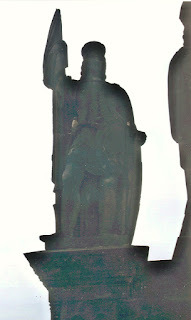 Include those reversed hands, for fun, in what to see in Hradec Kralove. Petr Ginz had relatives frm Hradec, who came to visit the family in Prague. Looking for the page. See overview and photos at en.wikipedia.org/wiki/Marian_and_Holy_Trinity_columns. There are many in the Czech Republic, Slovakia and Poland, many with Mary at the top, in thanks for deliverance from the epidemic about 1715 or so. Saints, haloes of stars, moving prayers about pestilence (From sudden death, Good Lord, deliver us, or similar words that echo in our own day). Please shift to the blog on Places of Petr Ginz for more information posts on Prague. Visit this site for paintings of the Jewish Quarter - artist Adolf Kohn, at http://www.jewishmuseum.cz/en/akhon.htm. He was born in 1868, and the views of an earlier time are a welcome contrast to the crowds of today. And the sadness of knowing what came after. Prague, of course, is haunted. Any place with history surely is. See www.grandtimes.com/Rambling_with.html. And, shivers at www.afallon.com/europe/places/prague.htm. 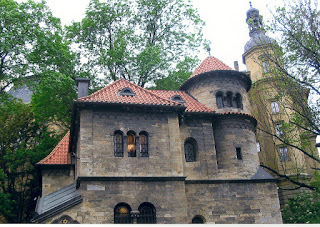 And www.expats.cz/prague/article/czech-culture/haunted-prague/. Ask about the pose of a statue, however, and see what the explanations are for an otherwise sinister-looking context. This fine statue fellow is in an unusual pose with a front leg extended straight forward and down, toe pointing, also known as the Iron Knight, looks the stuff of horror. The statue: Look closely, lower left - that is her head as you peer, she is partially sitting, head all disheveled and hanging low, and her legs limply dangle while he strides above, almost (not really) like fourth position, www.dgillan.screaming.net/stage/th-frames.html?http&&amp;&www.dgillan.screaming.net/stage/th-ballet3.html. The site says, however, that she is hiding her face for shame at the "sin" of falling in love with a Christian. Story does not hold together - she looks quite dead. Murdered even. Sin? Bother him? Not a whit. Plus ca change. Read about Rudolph II Habsburg, 1583-1612, Holy Roman Emperor and King of Bohemia and Hungary, a great patron of the arts, at www.metmuseum.org/TOAH/hd/rupr/hd_rupr.htm, a paper by Jacob Wisse, Stern College for Women, Yeshiva University. Other sides to rulers: Guidebooks and quick history look-ups are inadequate for anything but a fast orientation. Look deeper. There are other sides to people than the instantly seen, known. Rudolph II is also listed among the rulers of the world who are known homosexuals or bisexuals. How do they know? Each one would have to be vetted as to source, and weighed, see Homosexual and Bisexual Rulers and When They Lived, a list that includes rulers of Rome, England, France, Spain, Byzantine rulers, Sweden, Denmark, Japan, at ://www.gaylib.com/text/igay9.htm. China: see ://www.fordham.edu/halsall/pwh/china-gaytexts.html/ To us, the only issue is why orientation should be an issue for anyone, as consenting persons, unless it is strictly religious and then they of course can do as they like as to themselves, but not as to others not sharing that belief. The site's information stems from an agenda for acceptance of a group, showing it widespread among the rich and famous, but that does not in itself negate the validity. Vet the long list for any individual that surprises you because you did not know. 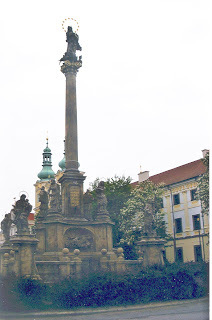 The site at ://www.remunda.com/travel/review/prague_monuments.htmlreferences an alternate explanation to the statue's context, involving some "O Udence" in Platnerska Street, and a sign now in the "town museum." I am now looking up O Udence. Only get "jurisprUDENCE". Translate "o" -- get "the". What about Udence? Now for Platnerska. 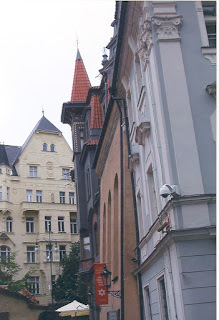 Found this map-photo of the street: www.prague.es/map/platnerska/6/. Timelines for emperors, rulers, events. For the world's best timeline site, go to the Metropolitan Museum site at www.metmuseum.org/TOAH/ht/08/euwc/ht08euwc.htm. Click on whatever timeline area interests you and suddenly clarity is yours. Vladislaw II. 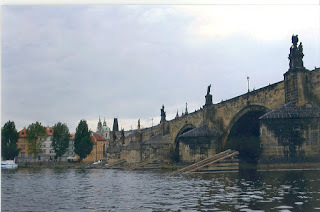 Use of this site to cross the Vltava River extends back to wooden structures until 1158 CE, when a stone bridge was constructed nearby and replaced the more precarious wooden structure. 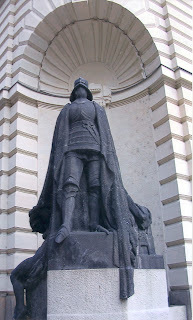 This was during the reign of Vladislaw II, Duke and then King of Bohemia. This stone bridge was one of the earliest European stone bridges since the fall of the Roman Empire. It was named in 1172 to honor Vladislaw's then wife, Judith of Thuringia, and named the Judith Bridge. This one was destroyed during floods in 1342. Prague, the Charles Bridge. Statues, musicians. 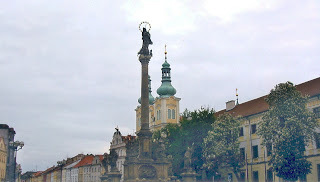 The Charles Bridge now boasts some 30 Baroque-style statues of saints. The first was erected in 1683. For photos, try http://www.sunpillar.net/bridgestatue.html. 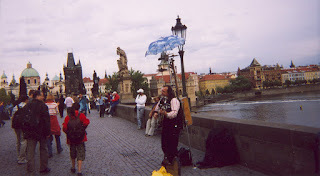 Some saints are familiar already, like Saint WenceslasThe bridge is a place of some tribute, but mostly small-commerce, hawkers, fakes, with many earnest and dedicated musicians amid them, and some nonsense for all the rest of us. For example, enjoy this a one-man band, with the view back to New Town, complete with umbrella against the drizzle. Street performers take up temporary or permanent residence. Orientation: At the far end is the 11th Century Powder Gate, the dark-stone tower; and Wenceslas Square, located at the dome. 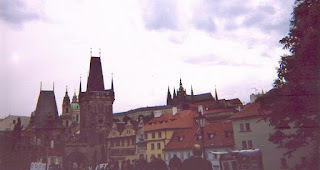 The Charles Bridge became a pedestrianized bridge recently, in 1950. 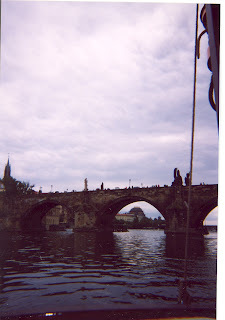 The Charles Bridge: It is long. It boasts 16 arches, and four carriages could cross abreast, or passing one another. The riverbank at the section of Prague known as New Town is here to the left, the opposite area to the right is the Little Quarter. 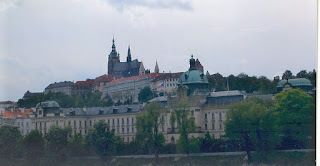 The hillside leads up to the castle and St. Vitus Cathedral area. The bridge requires icebreakers, here affixed to the base of the support piers to the bridge. Charles Bridge, Prague. Icebreaker structures at the piers. The massive bulwarks break up the ice before the chunks can smash the bridge. 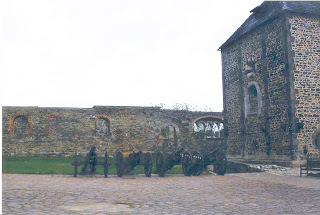 He appears twice: here at one end of the bridge in company with St. Norbert and St. Sigismund, not shown; and here on his own at the other end of the bridge. Begin and end with Wence. From whence. Other saints become familiar because of statues in other towns,. 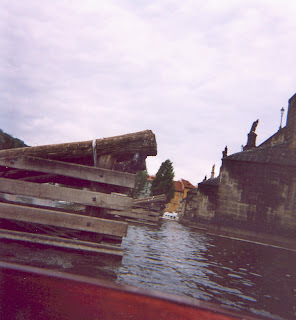 xxxThe Vltava River, has flooded often - see the water levels on the ladder-marker on the bank. See www.prague.net/blog/article/122/the-vltava-river-in-prague. See photos from disastrous 2002 at http://www.internationalfloodnetwork.org/04/rep_02eurPS(P1).pdf. Take a little boat trip, or a long one, now that all is quiet again. Go down the stairs to under the bridge at the New Town side, choose your size boat, get a free beer or soda, and bag of pretzels, and wait for the boat to fill. Not long. And the wait is sweetened. There is even music. 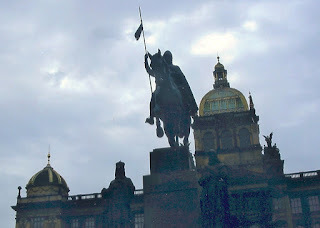 Wenceslas on horseback here, at the Storch House, Old Town Square. See it and other fine photos for an overview at www.msu.edu/~hillesla/prague/prague.htm. 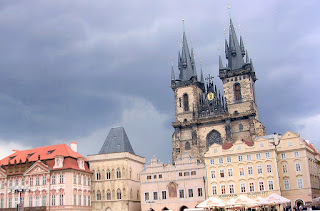 Prague's Old Town Square, with the splendid backdrop of the Church of Our Lady Before Tyn. See www.pragueexperience.com/places.asp?PlaceID=595; and www.prague.net/old-town-square. 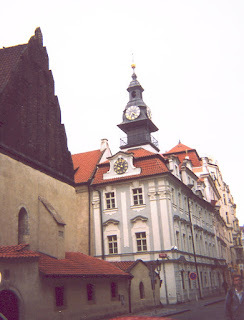 Nearby is the old astronomical clock on the town hall, also at Old Town Square. See utf.mff.cuni.cz/Relativity/orloj.htm. 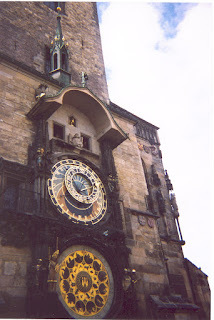 See Death tolling the bell, and the apostles rotating around at noon, if you can dodge the tourist tete in front of you. The historic center of Prague is a UNESCO World Heritage site. See whc.unesco.org/en/list/616. As background reading for walking around Prague, get "Time's Magpie - A Walk in Prague" by Myla Goldberg, Crown Publishers NY 2004. See all the bitty spots and big spots, not just in the Old Town Square, through a local lens. The great statue of Jan Hus was shrouded in scaffolds and tarps, but you can see it here: goeasteurope.about.com/od/czechrepublic/ss/oldtownprague_4.htm. He was on the reform road long before Martin Luther, so to some groups he is a heretic, to others, a hero. Here is an Anglican view: /justus.anglican.org/resources/bio/7.html; and here a Roman Catholic: www.newadvent.org/cathen/07584b.htm. Restaurants surround the square. Get a tidbit here, schmooze and ogle, and move on to the next. This modern Black Madonna and child was commissioned in the early 20th Century as a decorative feature of a new department store, The House of the Black Madonna. 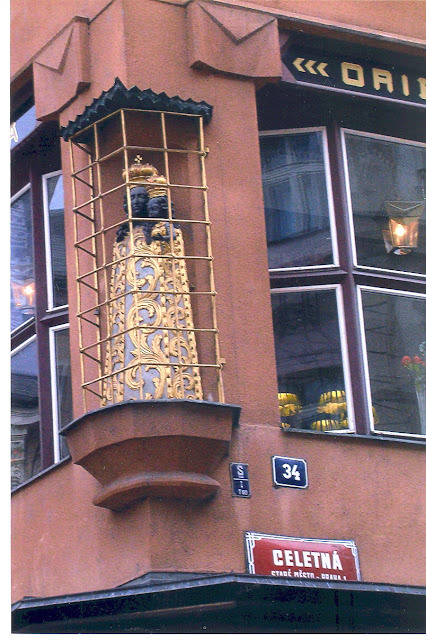 See www.prague.net/house-of-the-black-madonna. The building is known as one of the finest examples of Cubist architecture in Prague. See www.radio.cz/en/article/47925. That commission for a corner sculpture of Mary and Child, above street level, would be in accord with older devotional and protective tradition. Sculptures on the second floor corner exteriors of private houses stem were common in the 1400's, according to the Metropolitan Museum of Art Bulletin, New York, Spring 2007 at page 14, vol. LXI, no.4, by William D. Wixom. 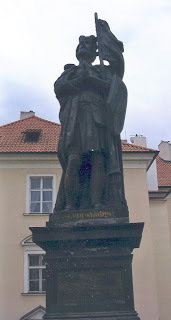 Wenceslas, born 907AD. His father was a duke, and Wenceslas succeeded him as duke when the father died and after overthrowing his mother as Regent in 922. He remained titled as a prince. Or duke. See www.vitejte.cz/objekt.php?oid=4546&j=en. Christmas carols notwithstanding. The "king" of the time seems to have been Henry II of Germany, to whom W swore allegiance and supported Christianity. W ruled Bohemia for only 5 years, and was killed by supporters of his brother, Boleslav, while he was fighting Boleslav. 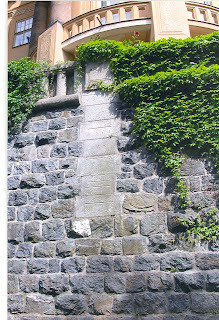 Very informative site: See www.royalty.nu/Europe/Wenceslas.html; www.radio.cz/en/article/91371/limit. So perhaps "King Wenceslas" refers more to monarch status than coronation? The song about him being good comes from a melody in the 13th century, and was written as we know it in 1853. His grandmother was Ludmila. The same as the Ludmila in Glinka's opera? See www.korschmin.com/forum/?p=64. Here he is in Wenceslas Square. With all the statues of Wenceslas in Prague, remember the one on horseback as being in the Square because it is a wide boulevard area that used to be a horse market in old times. 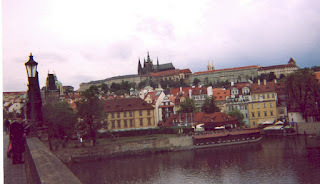 See www.pragueexperience.com/places.asp?PlaceID=605. He is also Saint Wenceslas. See www.roca.org/OA/45/45f.htm. 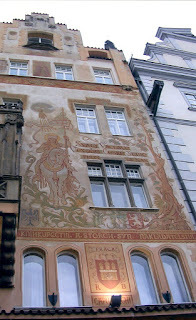 Here he is, the subject of a huge wall sgraffito or fresco or wall painting in the Old Square of Prague. And here he is among the line of saints on Charles Bridge. It is best to leave this high-ground area to its own day, if your hotel is across the bridge at the Old Town,. The best way around Prague is to walk, and the castle area is up stairs and a long way. See map at www.lonelyplanet.com/mapshells/europe/prague/prague.htm. We took a day to wend from our hotel through the Old Town, the New Town, and the Jewish Quarter. We planned this castle area for the next entire day. At breakfast, we looked up at the TV morning show at the hotel, and saw a horrifying sight: the day and date were one day ahead of what we had calculated, in all our jolly, fun-having witlessness. Dash up to the room, jam the stuff in our plastic grocery bags, then in the backpacks, race to checkout and get the car out of the hotel rear courtyard, grab directions to the airport from the clerk, and we were gone. Just made it. So, next time. For now, see the castle area at www.hrad.cz/en/prazsky_hrad/navsteva_hradu.shtml; or www.castles.org/castles/Europe/Central_Europe/Czech_Republic/czech5.htm. In any city, learn the silhouettes of the landmark buildings. The tall one here is the Little Quarter Bridge Tower, and the smaller is the Judith Bridge Tower. I cannot place the statue. Look yourself at the bridge statues, Little Quarter end, and try. www.sunpillar.net/bridgestatue.html. Some statue photo sites do not even try themselves. 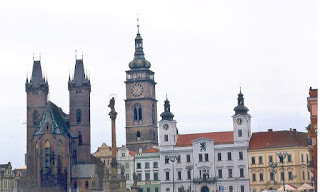 See tions.net/CA256EA900408BD5/vwWWW/photo~czech~prague. These things are interesting. Take notes! Note to self. 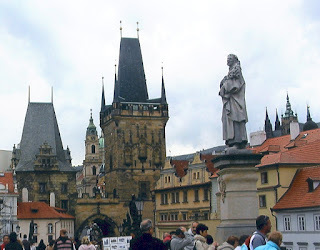 The Little Quarter, or Mala Strana, is at the castle end of the Charles Bridge, a warren of old squares, shops, churches and gardens. Distinctive is the Maltese Square, with its eight-pointed four equal-armed crosses. 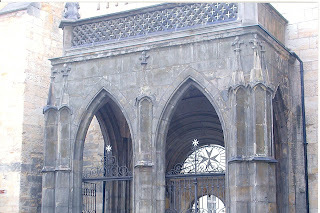 See http://www.prague-online.net/interest/malastrana.html. They were given refuge here by Vladislav II. This site describes the history of the Knights, from the island of Malta's events: see www.victorborg.com/html/cathedral_of_the_knights.html. Apparently, after losing on the mainland of the Holy Land, where they had been aiding pilgrims and other knights, they ruled Malta from 1530 until Napoleon forced them out in 1798. Debauchery, self-indulgence and other trappings of their wealth followed. Sigh. Surprise. 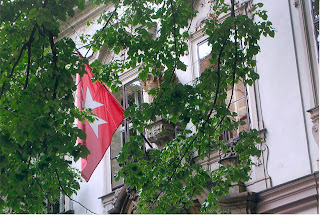 The flag still flies. Need to find out more about the Knights of Malta and the Knights Templar. See See Knights Templar insignia using the Maltese Cross. See Hatpins Collection Tour, Insignias, Knights Templar. 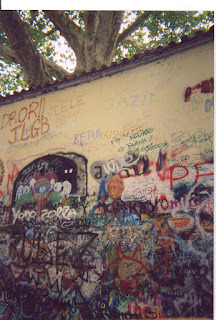 Here at Priory Square, on the wall of the Great Priory of the Knights of Malta, is the tribute wall to John Lennon - look closely amid the new graffiti and see the sculptured face, in relief, the ochre color. 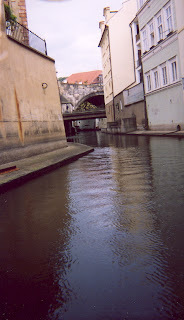 There is a branch of the Vltava River, that had been used as a millrace - looks like a view from Venice (almost). We took the little boat trip around. The island created by the waterway is Kampa Island. Find high-priced real estate and restaurants here. See //rene.spika.cz/prague_june/kampa_island.html. This face is unmistakable. 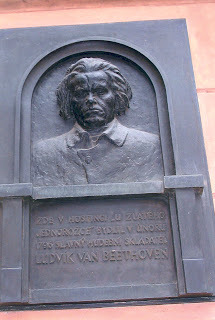 Ludwig was here in 1796. Find Josefov, the Jewish Quarter, on this map: /prague.ic.cz/prague-map.htm. We navigated to it by following the river. At first walk, the streets are a maze. 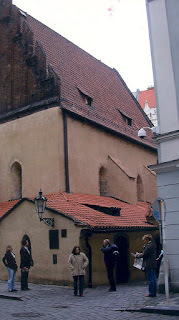 The Old-New Synagogue is, I believe, the oldest structure. The name honors the emperor Josef II who eased conditions for the Jewish community. See www.prague.cz/prague-jewish-town.asp. Photos are difficult because of the narrow streets and hordes of tourists. To get inside anywhere, get in a long line and wait,and wait for a bundled ticket. The Ceremonial Hall, built in the early 20th Century to serve the burial society, founded in the 15th century. 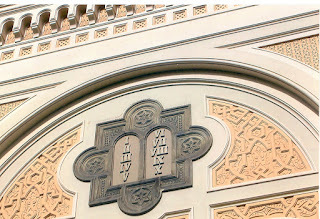 For all the synagogues and main buildings, and their history, see http://www.scrapbookpages.com/CzechRepublic/Prague/index.html. 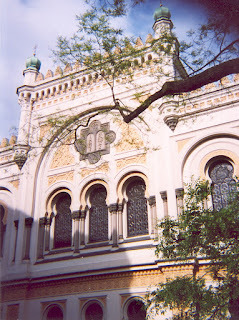 The Spanish Synagogue, built in 1868, inspired by the Alhambra, in Spain. For the Alhambra palace, see Spain Road Ways, Alhambra post. 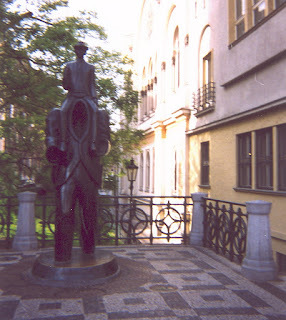 For an overview of Franz Kafka, 1883-1924, and a scroll-down for his statue in Prague, see www.kafka-franz.com/kafka-Biography.htm; or www.praguewanderer.com/en/3/articles/159/. Do a walking tour. www.nysoclib.org/travels/kafka.html. This is not your cemetery: yours is walled off, not even a glimpse available unless people buy a big bundled ticket with too many sights on it, with no choice. 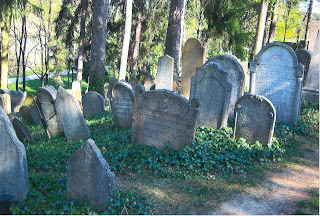 Short on time, and not liking sights in packs, we stayed with our view of the lovely cemetery in Trebic. Unbundle. Sever the high entry fees for all those forced-list sights. Let visitors choose what to see, and when. Buffets do well. Or no prix fixe without an a la carte as well. Cemetery resource: See www.scrapbookpages.com/CzechRepublic/Prague/Josefov/Cemetery01.html; understanding the financial problems with no state subsidies, we read carefully ujc.org/page.html?ArticleID=31803, scroll midway down for the information. We still think you will do better to unbundle.